I like doing dishes but hate the vile blobs used to do them. Sponges are deeply disgusting, and though you may try to convince me otherwise I have always felt this way, based on little more than my senses (i.e. after a few days of use, they tend to smell, look, and in all likelihood, taste bad). This is not terribly surprising. We use highly absorbent blobs to scrub off food waste, and then cast them aside—maybe soapy and wrung-out but basically still soaked through with food waste—so they can sit around damp at room temperature and harbor all kinds of life. When confronted with some especially bad ones, I’ve sometimes felt that inflicting the sponge upon the dirty dishes might actually make them “dirtier,” in some relevant sense. In desperation, once their grossness gets too palpable to ignore, we might run them through the dishwasher or throw them in the microwave, hoping this will mitigate the obvious grossness, and start the process over again. the inefficacy of usual methods of household sponge sanitation—though “cleaning” killed off some forms of bacteria, it promoted the growth of potentially pathogenic bacteria. To be clear: this study is pretty modest in its claims and does not make any attempt to link presence of these potential pathogens to any particular human illnesses, and suggests that future studies focus on actual pathogenicity of kitchen sponges. It does, however, suggest that hospitals, nurseries, schools heed the existing evidence and dispose of sponges regularly. 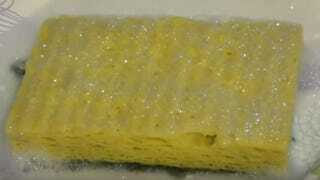 It recommends that a kitchen sponge user swap out weekly. As Egert admits, there’s much more to learn here, but his work confirms what your nose and eyes can tell you: Your sponge is gross, you should definitely reconsider the way you “clean” it, and are probably due to throw it right now.